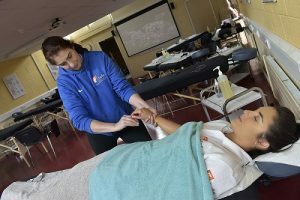 This Physiotherapy Assistant (Health Service Skills) course is designed to equip the learner with the opportunity of obtaining a Major QQI Level 5 Award in Health Service Skills 5M3782. This course aims to equip the learner with the necessary skill required to progress on to potential employment as a Physiotherapy Assistant or a Health Care Assistant. The course covers Physiotherapy Assistant Theory, Physiotherapy Assistant Practice, Massage as well as the Healthcare modules to equip learner with the skills and knowledge to care for clients as required by the Health Service Executive (HSE) to gain employment in the Healthcare sector. A Physiotherapy Assistant works with a Chartered Physiotherapist to assess and treat clients whose movement is restricted by illness, injury, disability or age. They implement the therapy programme created by a Physiotherapist and support the client in restoring or improving their mobility. In order to work in the Healthcare sector as a Physiotherapist Assistant or Health Care Assistant, you need to have an understanding and caring attitude, while also demonstrating respect and tolerance towards your clients while encouraging independence. Workshops in Massage, Occupational First Aid, & Patient Handling will be an important element of this course. This course will include some Saturdays throughout the year. On completion of this award students can progress on to potential employments as a Physiotherapy Assistant or as a Health Care Assistant in the Healthcare Industry. Students can use points gained at QQI to progress with furthering their studies in closely related and highly interesting courses in third level institutions across Ireland and UK. Past students have used points gained at QQI Level 5 to progress to Universities in Ireland or Universities in the UK such as Brighton and Universities in The Netherlands such as Saxion University. Students can use this major award (5M3782) to apply to colleges through the CAO. See the list of colleges accepting this award as an entry requirement here. Students can also progress to employment in the HSE or in private healthcare as a Health Care Assistant / Physiotherapy assistant. Garda vetting is a mandatory requirement for this course. All students are required to carry out 120 hours’ work experience to complete the course and must secure this placement themselves in a Healthcare setting.